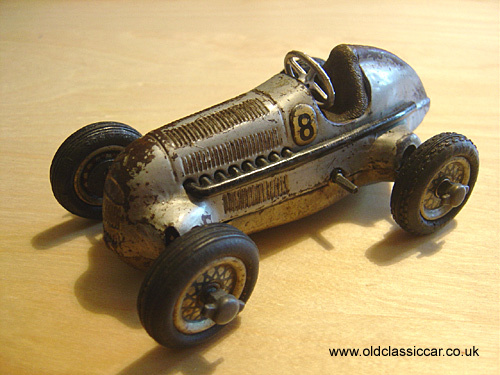 Schuco still manufacture quality tinplate toy cars today (see the later 1070 Schuco racing car page), and the racers have featured in their catalogue for years. The Mercedes Benz shown here dates to the late 1940s era, and is loosely based on the pre-war Silver Arrows cars. This one is in playworn but otherwise good condition. Schucos are assembled from a kit of metal pieces and they are often missing on early toys that you find now. Fortunately the silver Schuco Studio racer here still has its exhaust pipe, steering wheel, clip in racing number (8), wheels and knock-on spinners. Later examples of this Schuco racing car were referred to by the code 1050. An example of the smaller Schuco Piccolo Ferrari can be seen in the diecast toy car section. An early example of the pre-war Schuco 1750 can be found here. Colour: silver body and base, wind-up clockwork motor and steering.